B7 blue studs, xylan studs, or commonly referred “blue studs” are a commonly stocked item at Cyclone Bolt. B7 blue studs are often referred to this way due to their blue color. These B7 blue studs have been treated with a baked-on coating called Xylan or Teflon coating. This process takes a stud bolt that is plain and bakes on a special coating resulting in Teflon B7 blue studs. This process usually takes several hours to complete and is a bit more expensive than regular plain finished stud bolts, but the benefits of using B7 blue studs is far superior in high corrosive areas, high heat and high steam areas. Your B7 blue studs will last a lot longer than your regular plain stud bolts. Below are several advantages of coating with Teflon B7 blue studs. B7 blue studs possess a low coefficient of friction which reduces torque requirements. Therefore, there is an easy on/easy off properties exhibited by these B7 blue studs to provide safe removal with wrenches. Lower your plant maintenance cost and increase safety by using Teflon B7 blue studs. 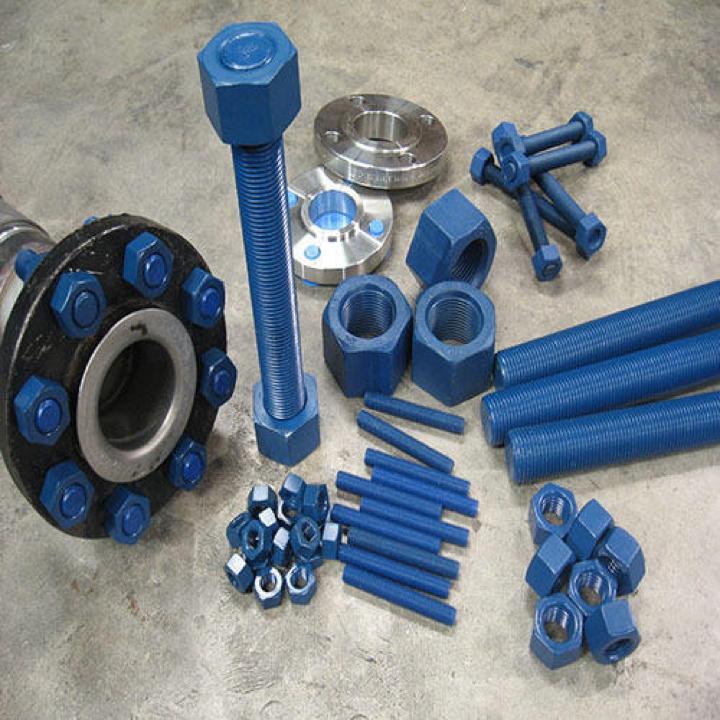 Sometimes referred to as xylan coated fasteners, this fluoropolymer coating offers a 2200 hour resistance to corrosion. B7 blue studs are viewed by many engineers as a cost-effective method of keeping corrosion under control, while not substituting for weaker alloys such as stainless steel. With Cyclone Bolt & Gasket located in Houston, Tx, we are capable of shipping to jobsites all over the lower 48 states. Next time your inquiry calls for B7 blue studs on a job, don’t hesitate to call Cyclone Bolt. We have B7 blue studs in stock and are ready to ship!